The Imperials of Cyrodiil have long had a presence in the Pale Pass. Some time in the First Era, Fort Pale Pass was built. The structure was apparently used as an outpost. For unknown heroisms performed at the Pale Pass, Kantus Jeril was appointed as the first Count of Chorrol. 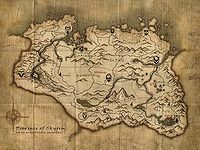 In 1E 2703, raiders from Akavir invaded Tamriel, landing on the eastern coast of Morrowind and trekking to the Jeralls. Reman Cyrodiil unified the remaining factions from the Alessian Empire to form the Army of Reman, and led an attack on the Akaviri invaders. Vivec, who was displeased with the invaders for trespassing in Morrowind, allied himself with the Trident-Kings of the Dreugh and attacked the Akaviri from the rear, blocking off supplies and reinforcements. The invaders then captured and occupied the fort in Pale Pass, which made for a well-hidden outpost. The fort ran out of supplies when messengers failed to deliver orders from the garrison at Grey Ridge, which would have informed Akaviri Commander Mishaxhi to ration its food, as the supplies were to be delayed by a month. The loss of its headquarters forced the Akaviri to surrender. Many were taken as prisoners of war by Reman, but the Tsaesci proved to be good advisers and helped Reman forge his new Empire; the Snake People even ruled the Empire for a while, during the Akaviri Potentate, until its collapse at the assassination of the potentates. The Army of Reman never reached the Pale Pass, and the supposed fort there was dismissed as rumor. During the mid-Second Era, the Pale Pass was still commonly used to travel between Bruma and Falkreath. Mountain travelers were known to leave offerings of food for the local masked bears, a species particularly common in the region around the pass. These "bear bars" along the trail are thought to have contributed to the domestication of the species for use as mounts. In time, however, the location of the pass seemingly faded from memory. The pass was unwittingly discovered by a thief on the 14th of Heartfire, 3E 362. The thief, known only as "G.S. ", had stolen the Ring of Omnipotence from the wizard Ortharzel in Cyrodiil. The thief tried to cross the border into Skyrim, but Ortharzel caught up with him in the Jeralls and blasted him down the mountain with two fireballs. The thief ended up in the Pale Pass, and used chests from the ruins of the Akaviri fort to hide the stolen ring. He left behind a letter for a friend of his before departing, intending for it to lead his friend to the ring should he not return to the pass. This friend never came to claim the ring. In 3E 433, Countess Narina Carvain of Bruma sent out scouts to find the pass. The countess was a renowned collector of Akaviri artifacts, and wanted to add the Draconian Madstone to her collection. The Madstone, a talisman which can protect the wearer from poisons of any type, was last reported to have been held in the ruins of the Pale Pass fort. The countess had come into the possession of a diary written by one of the failed messengers from Grey Ridge, Xhaferi. It recounts how he and another messenger, Sylaj, met their doom in the Serpent's Trail cave at the hands of ogres. The diary also came with a key to the fort and a rough map of the region. The countess sent out scouts and only located one of the landmarks from the map. She later hired the Champion of Cyrodiil to recover the Madstone. The Champion succeeded in getting to the fort, and discovered the Ring of Omnipotence hidden by the thief seventy years previous. The Champion located the bones of Xhaferi, preserved in the cold of the Serpent's Trail, and retrieved the undelivered orders, which were written on a slate rock. The ruins of the ancient fort were in bad shape, having been partially buried under snow. The subterrain of the fort was filled with undead Akaviri soldiers and dangerous traps. The Champion delivered the orders to the lingering spirit of Mishaxhi, which freed the fort's inhabitants of undeath. The Champion retrieved the Madstone and returned to Countess Narina Carvain. The Black Horse Courier published a special edition paper about the discovery of Fort Pale Pass, titled Pale Pass Discovery!, although they incorrectly attributed the fall of the fort to the landslide which had covered the ruins, rather than the delayed supplies. The Pale Pass appears on Nataly Dravarol's map of Skyrim, created in 4E 182, by which time it was once again in use. 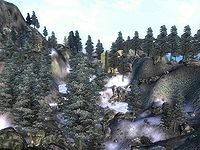 In 4E 201, the Pale Pass was all but closed due to avalanches, preventing Imperial reinforcements from helping to secure Falkreath Hold under Imperial control during the Stormcloak Rebellion. However, it remained one of the Legion's main supply lines, and access to the pass was needed to maintain an Imperial presence in Whiterun Hold. For game-specific information, see the Oblivion articles on Pale Pass and Fort Pale Pass. ^ Crumpled Note — G.S.